A really good friend of mine whom I come to embrace as a sister is all about the Hindu Religion and Culture! She has been teaching me much about the Gods and Goddesses in that tradition. She is not Indian but she is in Spirit!!! One of the most interesting concepts I have learned recently is the proper way to make offerings to the Gods/Goddesses in this tradition. They prefer 'fire sacrafices through the smoke of the offerings'! Since I am a Leo and my Sign is Fire ... I am all about the Fire and this concept makes much sense to me!!! Which probably explains why I like Candle Magick too!!! Any how one of the Gods I have been re-introduced to is Ganesha recently and this Divine Entity has fascinated me once before. 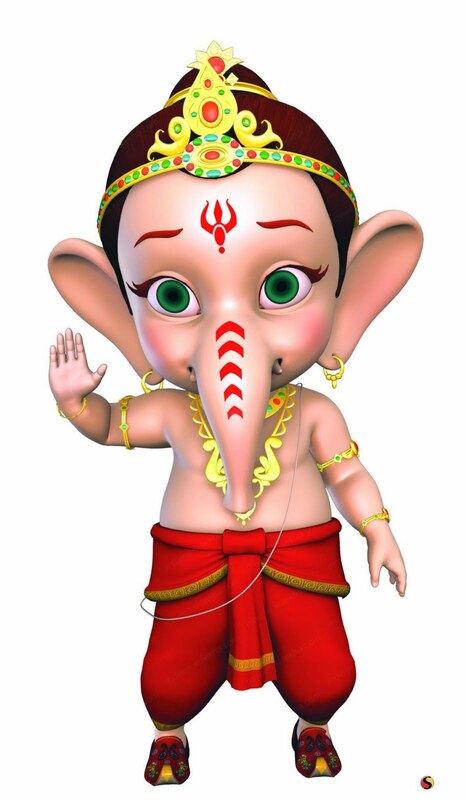 When I was in college I befriended a classmate whose name was Tunuja and I when I visted her home there was a fairly large statue of Ganesha by the restroom in their home. I asked why was that there and she had told me in their Culture Ganesha protected people while bathing and had something to do about his creation story! Maybe my dear friend River can shed some light for me on how this correlates to His Beginnings. What I thought I would do for know is share some interesting facts that I have recently learned about this wonderful God. If anyone of you want to share something not on this list feel free to comment and share. 1.) Ganesha is widely revered as the Remover of Obstacles and more generally as Lord of Beginnings and Lord of Obstacles. 2.) He is a patron of arts and sciences, and the deva of intellect and wisdom. He is also associated with writing and letters. 4.) A Mantra said to his favor is ~ (O Lord Ganapati!) You are (the Trinity) Brahma, Vishnu, and Mahesa. You are Indra. You are fire [Agni] and air [Vāyu]. You are the sun [Sūrya] and the moon [Chandrama]. You are Brahman. You are (the three worlds) Bhuloka [earth], Antariksha-loka [space], and Swargaloka [heaven]. You are Om. (That is to say, You are all this). 5.) According to Kundalini yoga, Ganesha resides in the first chakra, called Muladhara (mūlādhāra). Mula means "original, main"; adhara means "base, foundation". The muladhara chakra is the principle on which the manifestation or outward expansion of primordial Divine Force rests. 6.) Hindus of all denominations invoke Ganesha at the beginning of prayers, important undertakings, and religious ceremonies. He is invoked when folks are venturing into a new business and or buying objects like vehicles. 7.) An annual festival honors Ganesha for ten days, starting on Ganesh Chaturthi, which typically falls in late August or early September.The festival begins with people bringing in terracota idols of Ganesha, symbolising Ganesha's visit. 8. )Ganesha was particularly worshipped by traders and merchants, who went out of India for commercial ventures. Much of this info shared today came from Wikepedia and other internet sources. The Bath story told to me my Tunuja's parents is one I must locate because it still sticks out in my mind! With Summer Solstice just passing I thought it would be a perfect time to share some tidbits on the God with you all since He seems to be celebrated and honored in the summer months traditionally. Oh by the way before I take my leave I am getting back to writing. I miss it and I feel inspired by Ganesha no doubt since He is a Patron God of writing! Thank you so much River for helping me to connect or reconnet with this God!!! Oh perhaps my next topic should be on Indian Food! Nom Nom and a big yummy! Don't even get me started on Mango Lassi!! !